Sony is offering a firmware update for Digital Photo Frame 'S-Frame' DPF-D80 which was launched in October 2008. Note: Units with firmware version number "1.12" do not require this update. The set-up menu is not displayed when no picture to be displayed is available. Select "Various Settings" using the Direction buttons, and press the "ENTER" button. If the version is displayed as "1.10" or lower, update the firmware in accordance with the procedures starting from "2. Preparations for firmware update". If the version is displayed as "1.12", you do not need to upgrade the firmware. The download of the D80_V112.zip 4.88MB (5,126,055 bytes) file will start. Note: This is the dedicated update file for DPF-D80 only. You cannot use this file with other Sony digital photo frames, such as DPF-D70, DPF-D100,DPF-V900 or DPF-V700. Right-click the downloaded zip file (D80_V112.zip). The D80_V112 folder is now open on your computer's desktop. Use a decompression tool to unzip the saved file (D80_V112.zip) to your desktop. 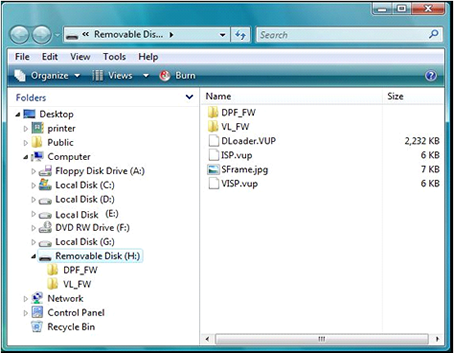 After you have unzipped the file, the D80_V112 folder will be created on your desktop. Double-click the saved file (D80_V112.zip). The D80_V112 folder is created on your desktop. Depending on your operating environment, some file extensions （*.VUP, *.vup, *.jpg）may not be displayed. Depending on your using operating system, the file may be automatically unzipped when it is downloaded. You may also not be able to unzip the file using the procedures described above, depending on the operating system that you are using. In latter case, please use a decompression tool. The folowing section describes how to update using a Memory Stick/Memory Stick Duo.If you are using an SD memory card, CompactFlash card, or xD-Picture Card, please replace Memory Stick/Memory Stick Duo with your using memory card in the following explanations. We do not recommend initializing (formatting) with a computer, as the DPF-D80 may not recognize the recording medium, depending on the type of initialization format.If you have no choice but to use a recording medium that has been initialized with a computer, copy a JPEG image file and check to see if it is displayed correctly on the DPF-D80. Open the D80_V112 folder on your desktop, and copy the update files inside it to the Memory Stick/Memory Stick Duo. Example of an update file that has been copied to the root of a recording medium using Windows Vista. Open the D80_V112 folder on your desktop, and copy the update files inside it to the Memory Stick/Memory Stick Duo that you have inserted into your digital camera. Keep pressing the "View Mode" button until the following message is displayed in the top right-hand section of the LCD screen. Note: If the above display does not appear on the LCD screen after 10 seconds, or if the display is distorted, remove the AC adaptor from the digital photo frame and re-insert it. Check that the (power) button is red, and start the update process again from "7. Update the firmware". After a few seconds, please check that the following message is displayed on the LCD screen. Note: It takes about 10 seconds to write the program. Note: The update takes about 18 seconds. Check that the firmware version is "1.12"
Note: If any images saved in the internal memory have been lost or damaged during the firmware update, save them to the internal memory again using the procedures described under the "Restoring image data to the internal memory" section. Procedure (1): Press the "ENTER" button on the digital photo frame. The LCD screen display will change as shown below. Procedure (2): Reinsert a memory card containing the update files into one of the digital photo frame's memory card slots. Procedure (3): Press the "ENTER" button on the digital photo frame. The LCD screen display will change as shown below, and the update will restart automatically. Initialize (format) the memory card you are using, re-copy the update files to the memory card, and attempt the procedures above again.